I’m not one for delayed gratification, so the moment the weather in Dallas lightened up on Saturday, I donned my new ASOS dress! Aren’t the shape and print fantastic? I feel like it’s very Mad Men. My baby blue Prada picks up the little notes of blue on the dress nicely, while the burgundy pumps darken the look up just a notch. I can’t wait to wear this dress without a coat later this spring! Definitely a new favorite. Some other great spring items from ASOS include this soft striped t-shirt dress and this pretty peplum-hem skirt. What’s in your closet that you can’t wait til spring to wear? You look lovely, I got the same dress and I would have to get a few alterations done so I just returned it. But it fits you exactly how I wanted it to fit me in my head. 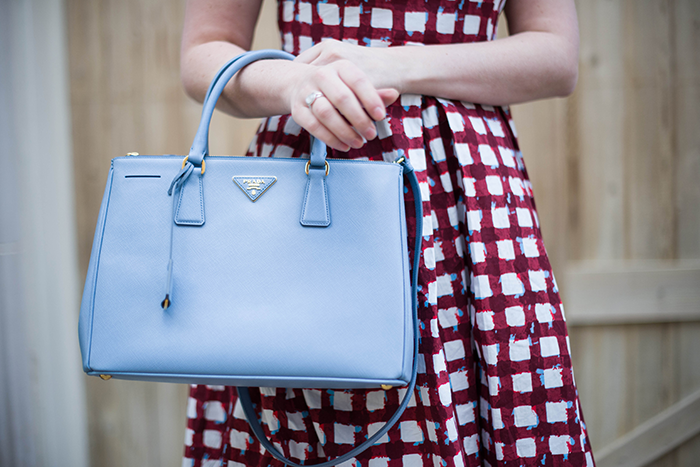 Love that you paired it with this gorgeous blue bag. Love everything about this look! So so chic. LOVE this look head to toe. Can’t believe that dress is ASOS. Wow! 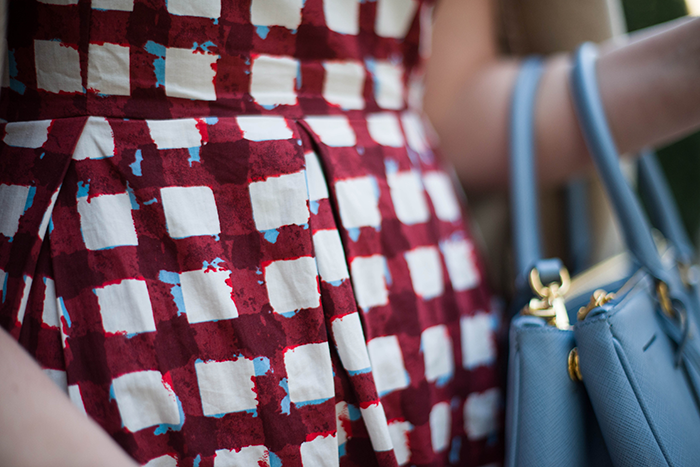 What a beautiful print, love that you paired it with the light blue bag. I love that dress! And you’re so right about the Prada bag picking up the blue notes in the dress. That fourth image, with the wind-blown hair is just so lovely. Great photo set. Love the print and the shape is always one of my favorites! I so wish I could get away with wearing things like this right now, but sadly I will have to wait a few more months. You look perfectly put together! Love the handbag! SO insanely jealous that you can do the whole bare arm/bare leg thing! This dress is stunning.. the colors are perfect and I love the Mad Men feel! You look beautiful though! SO classic! I adore the dress! I thought it was Marni! The color of those Zara pumps are perfection. And I need that dress for my 7 year anniversary. We are eating where JFK proposed to Jackie! That dress is soooo Jackie. This entire looks is perfection! I’m obsessed with that dress!! And it looks fantastic on you. Love the pale blue bag with it. You look amazing! That dress fits you like a glove, it looks like it was custom. LOVE how the blue bag ties into the blue dot in the dress. This is such a lovely and unexpected color combo. 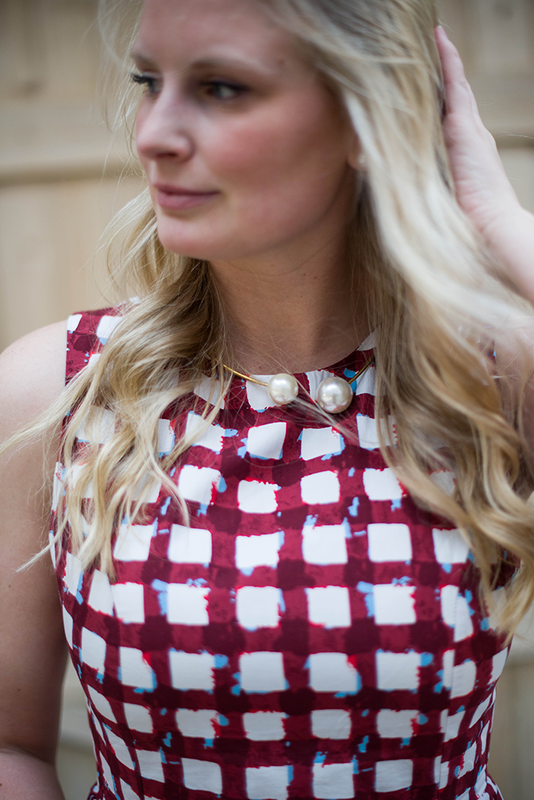 love that necklace and the dress pattern- pretty! Such a beautiful dress and perfect for January! Love the photos! BEAUTIFUL!! I will be buying that Anthro necklace. It looks like that Chanel one!!! YES! haha I did the same thing! 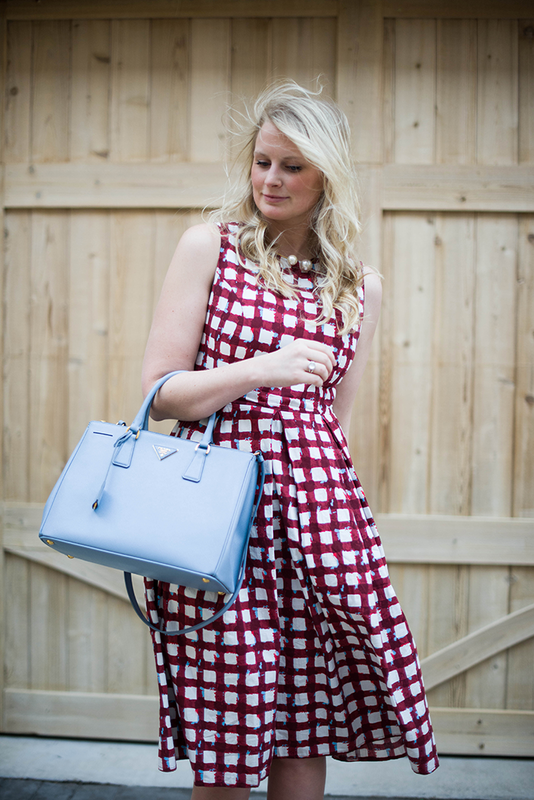 That dress fits you beautifully and loved how you paired it with that soft periwinkle bag! :D I donned a dress on our 75 degree day, but then at night it dropped and I was sans proper jacketry. :/ Brrr. Love how you paired this with the blue bag and oxblood shoes! Aw, ASOS strikes again! Beautiful, Merritt, and I can’t wait to wear my new floral print fedora.